Two Bears Farm and the Three Cubs: Can I Get Seconds on the Pink Stuff? Can I Get Seconds on the Pink Stuff? Pierce went to his first pool party this weekend. We hadn't been swimming since last summer. Pierce loved it but he was like a little monkey clinging to me. 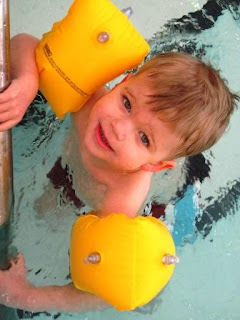 It's probably a good time to start some swim lessons with him...but I have no idea how we would manage that unless I had someone to watch the twins. 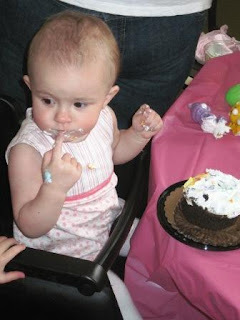 Mattie seemed to really enjoy her cake. 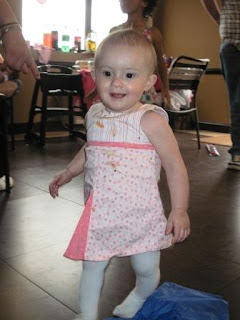 Now see that little hand on the bottom on her high chair? Yeah, that's Pierce's hand. Pierce moving in for the icing. Pierce sneaking his way toward that glorious whipped pink sugar. 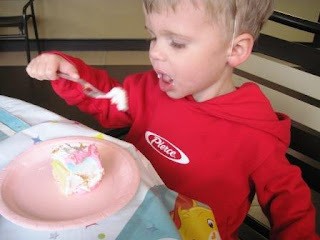 Fortunately, he got his own piece and didn't have to steal Mattie's after all. I could've eaten 50 pieces of Carebears cake. No lie. It was that good. Plus, it's nice to get a little dose of pink now and then, surrounded as I am by all these boys! I took like 50 pictures of Mattie but here's the thing. She's FAST. This girl is always in motion. ALWAYS. Thanks to Elizabeth for inviting us. We had a splendid time :-) And Pierce keeps asking when we're going to see you and Mattie again. Oooh, Mattie is adorable. I think I need to meet her. Pierce should definitely have swimming lessons. Check on it and let's see what we can work out. :) All of my pictures of babes are "babes in motion", so they're all blurry. :) oh well!